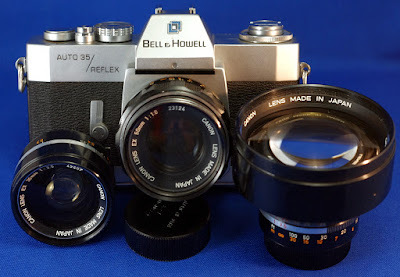 In the late 60's and early 70's, Bell & Howell were the US distributors for Canon cameras. The Bell & Howell Auto 35/Reflex is the US version of the Canon EX/EE introduced around 1969. Shutter priority auto exposure with manual capability. Rather than fully interchangeable lenses as most SLRs, it has a combination lens--the rear elements, focusing mechanism and diaphragm are fixed, the front elements are changeable with a simple screw thread. In theory this is an optical compromise--but with the advantage of much cheaper accessory lenses since they only require the front optical elements and no mechanical parts. The diameter of the 125mm front element is large compared to conventional lenses of similar focal length--see the comparison to a Minolta f2.8 135mm below. Front to back is about the same but the Minolta has a much smaller diameter despite a wider aperture. Only 4 lenses were available, 35, 50 and 125 shown above, and a 90mm. Aperture is either controlled by the auto exposure system, or it can be manually set by a dial around the rewind crank. In either case the aperture value is only visible via a needle display in the viewfinder, the dial only has 1.8 and 16 marked. Lenses are either f:1.8 for the 50mm or 3.5 for the others, it is necessary to reset the film speed dial when changing from one type to another. A peculiar result of this arrangement is that the maximum film speed is greater with the 50mm lens than the others. The maximum marked is 800, but the 3.5 lens can only use about 500. (Theoretically the 1.8 lens should be able to use around 2000--2 stops past the max of 500) At the time 35mm film maxed out around 400. The main distance scale is only accurate for the normal lens. On the accessory lenses there is a scale on the lens, with a dot on the focus ring. To use the scale the lens ring needs to be rotated to match, it appears to be easiest to set both to infinity. Unlike the normal focus scale the dot moves and the scale remains stationary. The viewfinder is a bit odd for a film SLR (but somewhat similar to modern DSLRs), likely to allow a bright screen despite relatively slow f3.5 lenses--the finder has no matte screen to judge depth of field, only a microprism for focus, and an uncommonly bright fresnel screen that is far more "in focus" than the film will be. An additional advantage in an old camera is an exceptionally clean screen--since the rear lens never comes off, there is less opportunity for dust to stick to the focus screen. 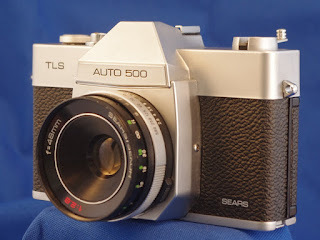 Like the Sears Auto 500 from earlier, this is an easy to use automatic SLR with compromises to meet a price--but the photographic compromises are considerably less. 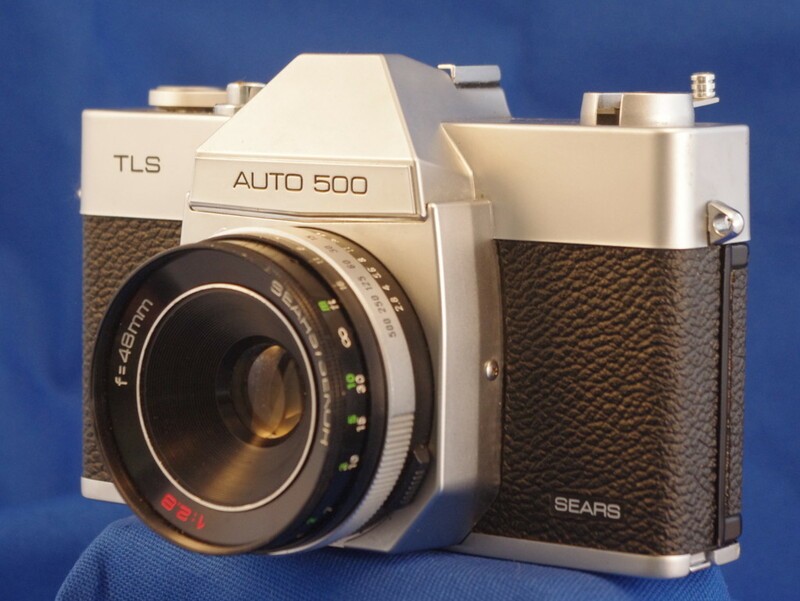 The Sears Auto 500 TLS is a Sears labeled version of the Mamiya 528TL, a camera with an odd set of features. It is a leaf shutter SLR with a fixed lens, giving the bulk of an SLR without the advantage of interchangeable lenses. Shutter priority automatic exposure, with the aperture it has selected visible in the viewfinder. The Mamiya version was introduced in 1967, I'm guessing the Sears version about the same time. While the camera is operated like almost any other auto exposure SLR (except the shutter speed is around the lens) internally the sequence is complicated--the shutter must be open most of the time to focus and frame the picture, with the mirror blocking light from hitting the film. In addition to the steps needed by a normal focal plane shutter, the shutter must close, wait for the mirror, open for the exposure, close, wait for the mirror again, then open. All this with springs, cams and levers rather than electronics. The aperture has only 2 blades, the lens isn't very fast for the focal length, and it is only a 3 element front focusing lens. As far as I can tell, the main purpose for all this is essentially the status of an SLR, with the ease of automatic exposure on a budget--it lets its owner claim SLR status. I believe the price in 1968 was $89, extremely low for an auto exposure SLR. At the time metered manual true SLRs were typically twice that for budget models--Minolta's base model SRT 100 was around $175 and was metered manual rather than auto exposure. This one appears to work fairly well, although I have not tested it with film. Shutter speeds appear accurate, the meter responds to light and the aperture changes as it should. The only problem I can find is that the stop on the lens is missing, so it does not stop at infinity, and without the stopit is possible to unscrew the front element entirely. In many ways this camera is very similar to the Kine Exakta. 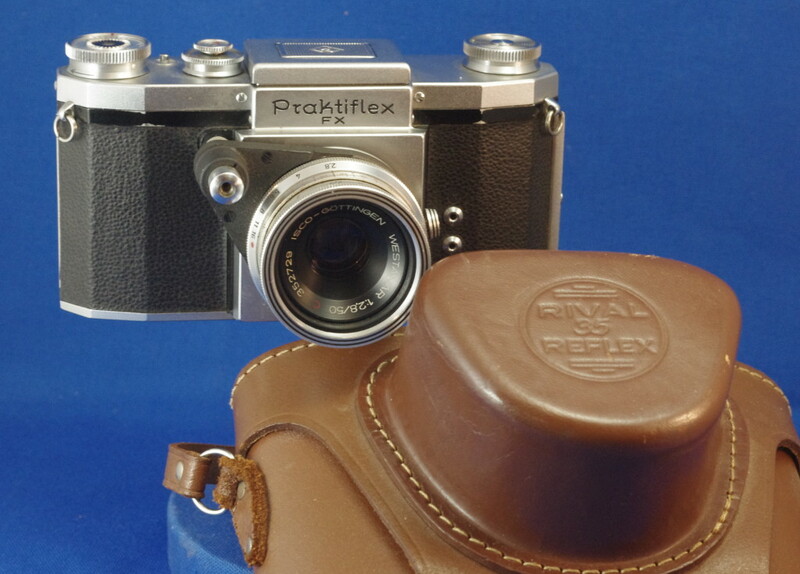 Like the Exakta it has a fixed waist level finder with ground glass and a magnifier, no focus aids. A flip up cover lets the finder box double as a sport finder for standard lenses. Film advance is by knob rather than lever and the film counter is manually reset. The back cover has no hinge, comes off entirely when changing film. Shutter is a standard cloth focal plane. The shutter control is a dual range dial that rotates when the shutter is released and rotates back when the film is wound. The upper dial selects fast or slow speeds, while the lower dial selects 1/25 through 1/500 or 1/2, 1/5 or 1/10. B is available on either range. Touching the dial as it rotates will affect the shutter speed. The lens mount is a very basic 42mm screw without the usual bar to operate a "modern" automatic aperture lens. Instead the camera has an automatic aperture lens, similar in operation to many Exakta lenses. In this style the lens has an arm that aligns with the front mounted shutter. Pushing the button on this arm stops the lens down, pushing more trips the shutter. On a camera without a matching shutter button this lens can be used as a preset, where the aperture is pre-selected on a ring while leaving the lens wide open with a lever to stop the lens down to the pre-set value. Note, the Exakta version has the shutter and therefore the arm on the other side of the lens mount. The FX in the model name refers to having both F and X flash sync available. This was the 3 sockets that look like pop rivets on the body to the left side of the lens. My camera came with an adapter to convert to a standard PC flash socket, unfortunately it has to be removed to change the lens. Since the adapter hasn't been lost, I'm guessing that this camera didn't have any auxiliary lenses with it. While the automatic aperture is a significant improvement over manual or preset lenses, it is still bulkier and more difficult to use than a rangefinder from the same era. I'm not sure about relative prices at the time, eventually Praktica became a bargain brand, generally lagging behind Japanese competition. The VP Exakta was a single lens reflex camera using 127 film, often called Vest Pocket film after the Kodak Vest Pocket camera that popularized the format. The Kine Exakta (also spelled Exacta, depending on the country it was exported to) was the first mass produced 35mm SLR, introduced in 1936. It was based on the VP Exakta . Kine indicated 35mm cinema film. It included a single stroke wind lever (most cameras still used knobs) a focal plane shutter and a wide variety if interchangeable lenses. This camera is a 1952 VX, the US version of the Varex VX--very similar to the Kine except for the interchangeable viewfinder. 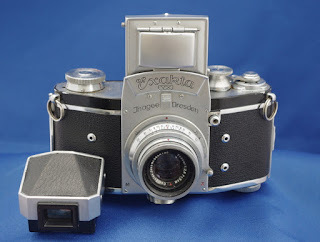 While the modern 35mm SLR dominated serious general purpose photography from the late 60's until digital, early SLRs were specialty cameras, significantly more difficult to use than most other cameras. These early Exaktas had waist level viewfinders showing an image that was right side up but reversed left to right. This made following moving subjects difficult, so the viewfinder hood had square holes cut in the front and back to use as a sports finder roughly approximating the view of a 50mm lens. Focus was via ground glass, with a magnifier for fine focus. No split image or microprism, so more difficult to focus than a rangefinder. The mirror requires more distance between lens and film making wide angle lenses difficult. On the other hand, since you use the taking lens to focus telephoto and macro lenses can be focused accurately and without parallax. Rangefinders had difficulty with both. The aperture affects the image in the viewfinder--smaller apertures dim the image and hide focusing errors, so it is necessary to set the aperture after focusing, then use the dim image to frame the final shot. The procedure for taking a picture was to wind the film, calculate exposure (few cameras had meters yet, so use experience or a handheld meter), set the shutter speed, compose the picture in the reversed viewfinder, focus, set the aperture, re-frame the picture in the dimmer viewfinder then take the shot. As soon as the shot is taken the view goes blank until the film is wound again. With most other cameras the procedure would be to set both shutter and aperture in advance, frame and focus in one step and push the shutter. A slight improvement was preset lenses, adding a preset aperture ring. This did not control the aperture, rather it set the minimum aperture available on the other ring so the photographer could stop down by feel. Eventually semiautomatic and automatic aperture lenses were introduced. These had their own shutter button over the camera's button, and pressing this would adjust the aperture before tripping the shutter. Semiautomatic apertures didn't re-open automatically, there was a separate lever or button. In 1949 Contax introduced the first SLR with a pentaprism--this allowed a normal view through the lens--right side up and unreversed. Exakta began a series of running changes working towards an interchangeable viewfinder. In 1950 all the pieces were ready, and Exacta introduced the Varex/V with an available pentaprism finder. Revue was a brand sold by the German photo giant Foto-Quelle (Google translates as Foto Source). Cosina is a Japanese company known for building cameras to be sold under other brand names, both private label like Revue and for other makers like Nikon and Olympus. 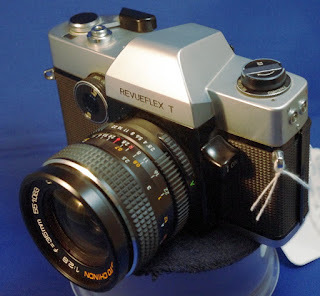 The Revueflex T is a variation of the Cosina SLR (with SLR being the model name, not just a description). As best I can tell, this was introduced around 1971--one source puts the original SLR model at 1968. Universal M42 screw mount with stop down metering, Copal Square type vertical metal shutter with 1/125 sync speed. Appears to have also been sold as the Carena 1000, a house brand of Photo Porst, another large German photo retailer. A very similar camera was sold as the Vivitar 220/SL with similar features and layout, except the shutter speed was on the top. Vivitar is a distributor only, not a manufacturer. Other than the metal shutter, not a particularly noteworthy camera, but representative of the many cameras of smaller makers that copied the Pentax Spotmatic format. However because of the name Cosina SLR a difficult one to track down (As if Ford had a model called Truck)--I tried to figure out the OEM model that matched this and originally failed--the closest match was the Vivitar 220/SL. I stumbled across the picture above on a page of Google Images searching for Vivitar Cosina, and when I looked at the source page I found the specification matched my camera, and the differences were limited to trim. While the source page had both the Vivitar and the Cosina SLR it didn't note the similarities, nor did it mention the Revueflex.